While the Sprint/T-Mobile merger is on hold by the FCC, T-Mobile CEO John Legere visited the Overland Park Sprint campus Friday. OVERLAND PARK, Kan. — While the Sprint/T-Mobile merger is on hold by the FCC, T-Mobile CEO John Legere visited the Overland Park Sprint campus Friday. Outside Sprint World Headquarters in Overland Park were protestors. But inside, Sprint employees heard a message of unity. "There was a strong commitment on the part of John Legere that Kansas City is a critical hub for the company. It will act as a second headquarters," said David Tovar, Sprint Vice President of Corporate Communications. The Sprint/T-Mobile merger has been talked about for months. Progress was stalled by the FCC. "We just want him to promise that during this merger, the 4,100 jobs in the Kansas City area will be protected and the 28,000 thousand jobs we project will be lost, will be protected," said Tammera Chaffee with Communication Workers of America. With Sprint having such a large footprint in the Kansas City area, job loss is a big concern. "I think John Legere knows we are here and we intend to be everywhere he goes to make sure he makes a commitment to protect these jobs," said Chaffee. The Sprint Campus is in Overland Park. The Overland Park Chamber of Commerce has praised the merger. 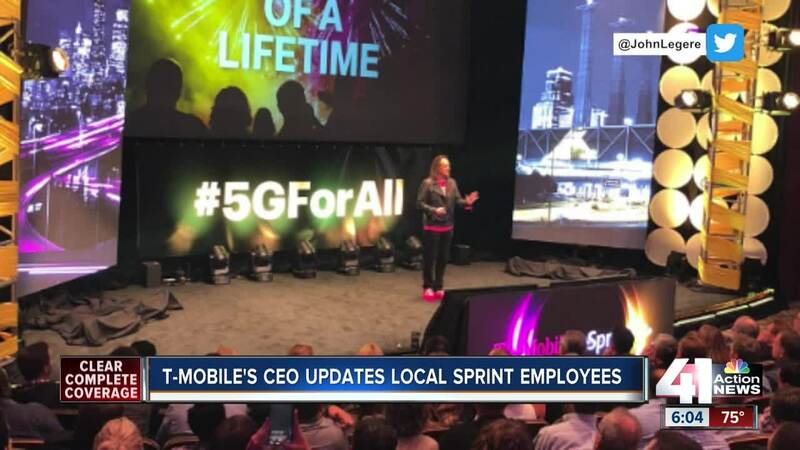 "The visit from T-Mobile CEO underscores the importance that Sprint's presence in this community, that both companies value highly," said Tracey Osborne Oltjen, president of the Chamber of Commerce. In a private town hall, T-Mobile CEO John Legere and Sprint leaders answered employee questions. T-Mobile is not obligated to keep the Sprint campus or a certain amount of jobs. Those close to the merger say the intent is not to cut hundreds of jobs. "The intent for the company to be strong, not just present in Washington but to be present in the Kansas City region and for there to be strong job opportunities," said Oltjen.